One of the things that happened over the winter to Floating Empire was the utter failure of the spar varnish we had lovingly layered on to protect the natural wood of the sides. Frankly, it just looked horrible. So, in casting about for an idea to make it look un-horrible we went back to an older post about the artification of the boat. On one level, the sides are just a series of frames. Hmmm. 1) Paints must be durable outdoor paints, capable of living through at least a two year constant exterior exposure to water, sun, wind, and rain. 2) No appliques, nail ons, or other non-paint additions (we will consider some special ideas, if you have em, but weight is an issue). 3) Do you have to come to Maryland to paint this directly on a moving boat from another moving boat? . . .um. . .probably. We're open to most themes and styles (marine themes not necessary, though we're happy to see them), though things that will get us arrested, things that look like gang graffiti, and overtly religious or political themes are unlikely to be considered. Bear in mind, we have to LIVE with this, guys. The judges are not impartial, but cannot be bribed. . . .
. . .hmm. . . .well, maybe. Submissions like this one may be sent to our web address. One of the things that went wrong when we first launched the Floating Empire was that, with our floatation in place, we were too tall for the roads. As a result, we wound up putting all our floats inside the aft of the boat for transit. . . .
19, count em, 19 floats where the studio and stairs should be. . .
. . .which, of course, meant that we couldn't finish the internal walls, the aft stairs, and a whole host of other things to make sure we had room to accommodate them. Over the last year, we've been piddling away at stuff, installing the aft stairs, finally framing in the matchstick blind walls surrounding the tub (great idea, btw. Privacy, but LOTS of airflow. ), and a thousand other small things that needed doing. Finally, this week, we decided it was time to actually make our tub/shower setup functional. We were familiar with Ivation from our mini dehumidifier, and knew their stuff was, in general, relatively well made, so we thought we'd give the $40 unit a shot. It features a submersible pump with a lithium battery incorporated. The device charges from any usb outlet in about two hours. In practice, the use is pretty simple: We fill a two gallon container with river water, add a teakettle's worth of boiling water, and plunk it down in the tub. 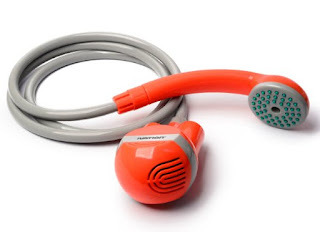 Turn on the pump, plunk it in the bucket, and you have a hot shower. Submersible pump with waterproof switch. The motor is fairly quiet, and the flow rate of the water is more than adequate, which rather surprised us. The rate of flow is just fine for washing hair. With summer coming on and the crowds returning to the marina, not having to rely on getting into the shower when you want to is a major plus. All in all, the little unit seems to work quite well, though it does lack any kind of shut off on the shower head itself. The only other negative we've found so far is the unfortunate tendency for the hose to pop off the compression fitting that holds it to the pump. Adding a tiny bit of tape under the fitting seems to have fixed that. I could see this gizmo being handy for chores like washing decks, doing dishes, and the like. It would also be handy for washing your hair when in the bath. Nothing like a cool bath on a hot muggy day. So now, with the tub and shower working, we feel like all the systems we'd originally intended for Floating Empire are now either functioning or discarded. Only took us a year. Stay tuned for other quick results. New stuff coming up on Onboard Cooking and Life, Art, Water, our other blogs, so check em out. More shortly. Got lotsa stuff to post to the blog. ....okay, impossible. It made it freaking impossible, okay? We had to call Tom, the owner, and ask them to bring us some water as we were sitting on the damn mud and couldn't even pump up water to filter, but I digress. Over the last couple of months we've puzzled over some way to make this easier. This was made more urgent when Morgainne took a rather nasty spill getting onto the dock. She didn't splash, but the bruising was magnificent. Thus, today we finally bit the bullet and I built a small staircase on the starboard side of the bow. Not done yet, but you get the idea. It's pretty simple: We used precut, pressure treated stringers upside down (which makes for a steep but space saving set of steps) and 1" X 8" for the treads. (They're only about a foot across). I dog eared the edges to keep us klutzes from snagging on them. 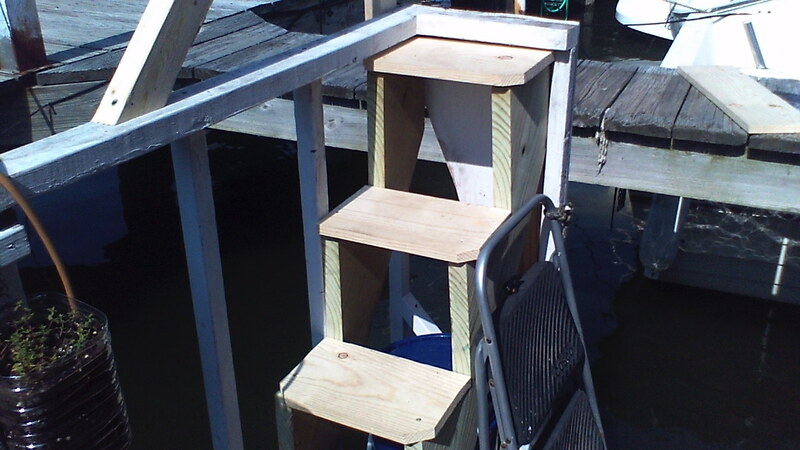 It makes getting on and off the vessel a LOT easier, especially after I added a handrail. Already we're using it, and I'm amazed I didn't do it sooner, So, tomorrow, paint and stain and prettification. Just thought we'd pass it along.
. . . .the good, the bad, and the mercifully little ugly. I thought, now that we'd been using the Butterfly Kerosene Stove and it's attendant oven for six months now, that I'd would give you a bit of an update. The stove, Oven, and Wicks. The little Indonesian made stove is available in the US from St. Paul Mercantile, people we can personally recommend you deal with. They know their products and their customer service is exceptional. 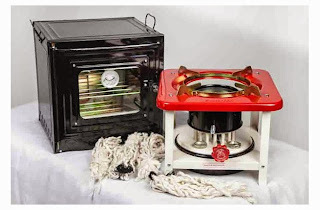 The stove is a 16 wick, unpressurized kerosene cookstove with a steel catalytic converter, generating about 10,000 BTU when up full and up to temperature. The oven is a well made reflector oven that sits atop the stove when in use. Over the last six months we have used the stove here aboard Floating Empire literally on a daily basis. Morning coffee and tea, breakfast, lunch, afternoon tea, dinners. The thing gets used constantly and has been our main cook source aboard ship. So, here we go: Here are our experiences with the stove. The little stove performs beautifully. It produces a flame far hotter than alcohol or propane, without the attendant dangers of either of those fuels. It lights instantly, just raise the edge of the catalytic cylinder and wipe a lit match along the raised wicks. It will simmer, it will sear, it will do just about anything any other stove aboard ship can do, but it does it with aplomb. The thing is, the stove and oven just work, without complaint, complexity, or reliability issues. 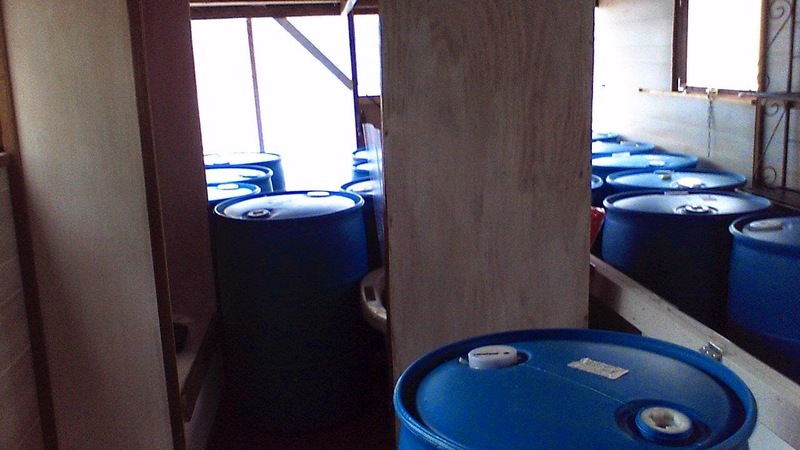 The ample pot stand will accommodate the very largest vessels without complaint or worry of it tipping. As long as there is Kero in the tank, a wick that will reach it, and an available match, you have a stove. No pumping, no pressurized gas to mess with, the flame is visible, and we have cranked out some truly magnificent meals over the last six months on the thing (here see Onboard Cooking, one of our other blogs). The stove, of course, is not without it's foibles. 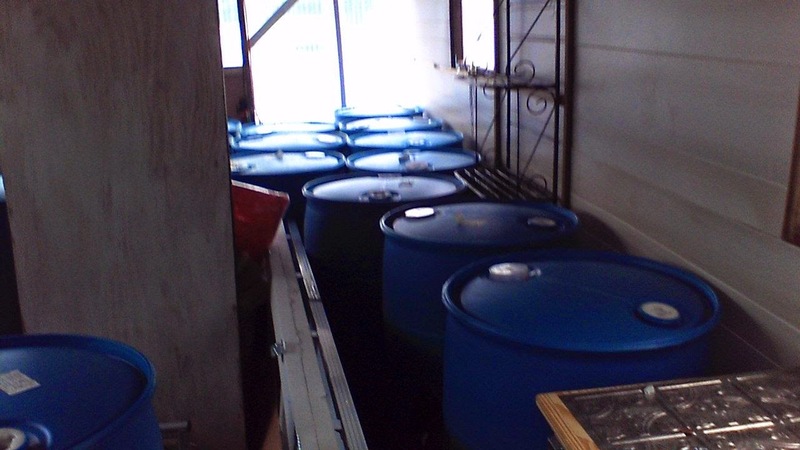 The kerosene basin isn't sealed, the wick assembly just being held by being wedged into it. That means that overfilling the stove or tipping it--even when moving it--results in the stove leaking, potentially rather a lot. There is a fuel gauge to help you when filling, but all it really does is warn you when it is getting rather too full. Beyond that, it's accuracy is questionable. The instructions say to basically double the wicks over and pull them through from the center. The problem with this is that the wicks--which resemble cotton floor mop yarn--are of rather variable thickness. Some slide in easily, others take pliers. That would be fine, but it means adjusting the wicks as they burn becomes problematic. The first time we attempted to adjust the wicks, it was simply impossible, even trying fingernails, pliers, hemostats, and tweezers to pull them up a bit. We wound up, on consulting with the nice folks at St. Paul Mercantile (another shameless plug, these are really nice folks), simply making a small loop with which to pull the things through and burning them as single strands, which has worked just fine. Removing the wick assembly from the rest of the stove is problematic. The damn thing is REALLY wedged in there, and ugly creaking sounds when trying to pull it up by the wick lifting assembly scared us into not trying that. I wound up prying the rim up to get the thing loose, which inevitably damaged the paint a bit. My recommendation is that you pick one spot on the wick assembly for prying, accept the fact that you'll chip a tiny bit of the paint there, and deal with it. The wide stance and very large pot stand will accommodate large, heavy cookware (we almost exclusively use cast iron here aboard), but smallish pots may literally fall through, or fail to sit evenly or securely (we use a bit of cooling rack over the pot stand to hold them). The height of the unit may make for problems on normal countertops (Morgainne has a hassle stirring deep pots atop the already tall stove). We'll be re-engineering our hearth top to lower it a bit as a result. Temperature regulation takes some getting used to. The catalytic burner takes about three minutes to come up to temperature, producing, if you have things adjusted right, a hot, clean, blue flame. Until then, the temperature is low a bit, and any attempt to set the stove is unreliable. Once up to temperature, anything from a slow simmer to blast furnace heat is possible, but you have to remember that the wicks only move a fraction of an inch, and very small moves of the knob can have rather large effects, and that there is a certain lag between the adjustment and the results. Moral: take your time, making adjustments in small increments until you get used to the device. Using the oven is similarly touchy, and took us several tries of "too hot/too cold/too hot/too cold/should this be smoking like this?/I think I just put the stove out" before we got the hang of it. We DID, however, quickly get the hang of it. When turning the stove out, you'll look down and see it still burning, and will be tempted to blow it out. Don't! What you're seeing is residual kerosene at the top of the burner rack burning off. Blow it out, and the odor of unburned Kerosene will waft through your galley. Be patient, it will go out in a few moments. Yeah, I know I'm a slob, but this isn't my doing. There are some largely cosmetic problems as well. Almost immediately when we got the stove, the paint on the catalyst began flaking off (it still is, though it's mostly gone). This affects the performance of the stove not at all, but it's messy. The array beneath the wick riser is very difficult to clean (I suppose I'll really scrub it next time I have to take it off to replace the wicks). See the red coloring? No I didn't bleed on it. 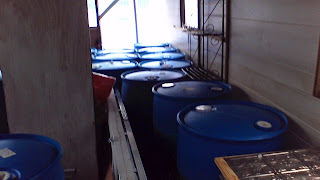 In parts of the US, kerosene is required to have a dye to differentiate it from taxed, fuel grade kerosene. That dye stains the paint on the unit, and is highly resistant to removal. Would I buy this thing again? In a freaking heartbeat. I have cooked aboard with electric, wood, propane, butane, and wishful thinking. I will never use those again aboard ship. Kerosene is simply too good and safe and inexpensive and convenient a fuel, and this stove/oven combo does a beautiful job of that. Seriously, for all the minor flaws, once you get comfortable with it, I absolutely guarantee you will be fully satisfied with it's performance, it's fuel sipping economy, and the wide range of things you can cook on it's ample pot stand. The Butterfly 16 Wick Kerosene stove is a great, reliable, and inexpensive solution for any vessel, cabin, camp, or tiny home. At only about $60 for the stove alone and $130 for the stove/oven combo (At time of writing here in 2015 of course), they are a MAJOR bargain. We recommend them without hesitation. Hey new stuff at Onboard Cooking and Life, Art, Water. Check em out. 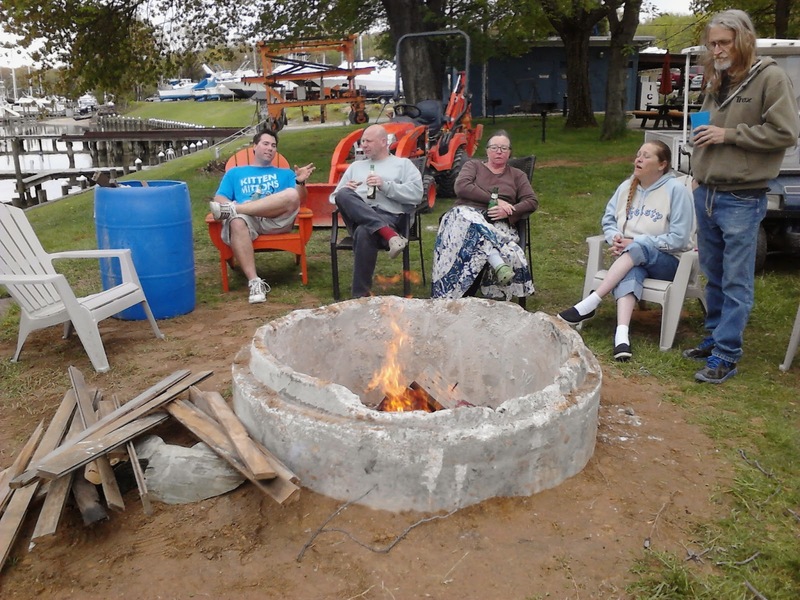 We successfully survived Memorial day weekend, along with the attendant partying at the Marina. The good news is that we won't need to eat again until sometime in August. We will, however, be doing an indegogo crowdfunding campaign for new livers. The weather was absolutely perfect. We love living in this place. New stuff for our shower and other storage shows up today, so look for a video soon on that. New recipes at Onboard Cooking too! I am NOT going to watch this! So this week we had occasion to revisit our downsize by moving the stuff in our storage space to one far closer to our Marina. We were very, very fortunate to have made the initial storage decision we made: Our original destination was up the Nanticoke river in Delaware, and we contemplated getting storage there. Where we've wound up here on the Middle River, that would have been a three hour trip just to get to our stuff. As it was, our storage space near where we built the boat is now nearly an hour away, and that was plenty. Artwork in the Storage Facility hallway. Ultimately, though, the distance, time, gas, and rental expense became unsupportable, and we managed to find much less expensive storage within walking distance of our boat slip, which was perfect. . . .
. . . .but of course it meant we had to go and GET the stuff. Now here's the deal about downsizing onto a boat: One of the most common comments we got when planning our move aboard went something like "I could never do that, where would we put all our things?!" It is those "things" that are the problem. We are, to a very great extent, owned by our possessions. We spend a lot of time and money not only on our stuff, but on places in which to safeguard and maintain that stuff, even if we never even look at it. a) If you haven't touched, looked at, used, thought about, or tripped over something over the last two years, you don't need it and won't miss it. b) Get a storage locker for everything else. Gradually pull out the things you find you can't live without and figure out some way to keep them with you. Whatever's left at the end of that time, you don't need. 1) Family Memorabilia. What the hell do I do with this stuff, some of it from the 1830's? I feel like I'm the custodian for it in some way, but who gets it after me? This is always a problem. The stuff just lurks there in bins and boxes, defying you to dispose of it improperly. 2) Tools, kitchen stuff, and assorted devices that we know we'll need eventually(or wished devoutly we had brought with us), but have no real room for on the boat. Eventually, some of this finds its way back aboard. The rest can go away. 3) In our case, artwork and supplies (Morgainne is a visual artist) and manuscripts and costuming (I'm a writer and theatre geek). This stuff has value, and represents either works available for sale or works in progress. Much of it is problematic for a boat due to size or fragility. I suppose this category might, for most folks, also include things like important papers like titles, tax forms, etc., and collectables that might have resale value. 4) This Box (as in: "What the hell is in this box!?"). Stuff that got slammed into boxes, bins, crates, and bags at the last desperate minutes when we were doing our final move out. Moving storage spaces gave us the opportunity to revisit some of this stuff and a bit of it went straight into the dumpster. Carefully layering framed artwork. We broke a few anyway. Having this stuff closer makes it far more likely that, over the next year, we'll be able to continue winnowing it out, and makes getting to same somewhat less cumbersome. Based on our experiences, in your consideration of storage, though, keep a few things in mind. First, if you don't know your final destination, don't guess. Opt for a storage facility near your point of departure, which will at least minimize the effort expended on THAT part of your downsize. Otherwise, you risk putting your stuff someplace you wind up not being. Second, plan on a serious revisit of your storage at about two years after your downsize to see just how much, if any, of that &%&$ you really need to be paying to store. Whatever you do, know that the downsize is not only possible, it makes for a cleaner, far less stressful life. Once it's done, it's done, and you no longer have to go about dragging all that stuff like a snail dragging its shell. Enough Said. Hey new stuff over at life Art Water. Now sneaking up on a year on the water, we are beginning now to make more and more revisions to make the living space reflect the way we. . . um. . .actually live in it. I thought I'd pass along a few of the things we did yesterday. Trying to wrangle the kitchen clutter, we've added a second shelf beneath our glassware shelf to accommodate tea things and toiletry items. The cloth bins were a dollar store find, and serve to keep things easy to reach while preventing them from leaping to their deaths whenever a wake hits us. To make a bit more room, we've moved our tea and coffee cups to hooks above the sink area. We had just enough space to make room for all our cups and mugs above the sink. The upshot has been that we can now actually FIND things when we need them. It's an ongoing process, contouring the living space to the way you live, and in a small space like a shantyboat or tiny home, small changes can make big differences in the quality of life. Over the next few days, we'll be moving around some of the hanging rails we have on board, and hopefully FINALLY getting our bathtub and shower in workable shape. 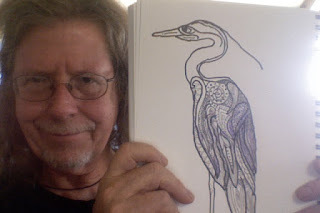 New stuff on Morgainne's blog Life Art Water. Check it out. 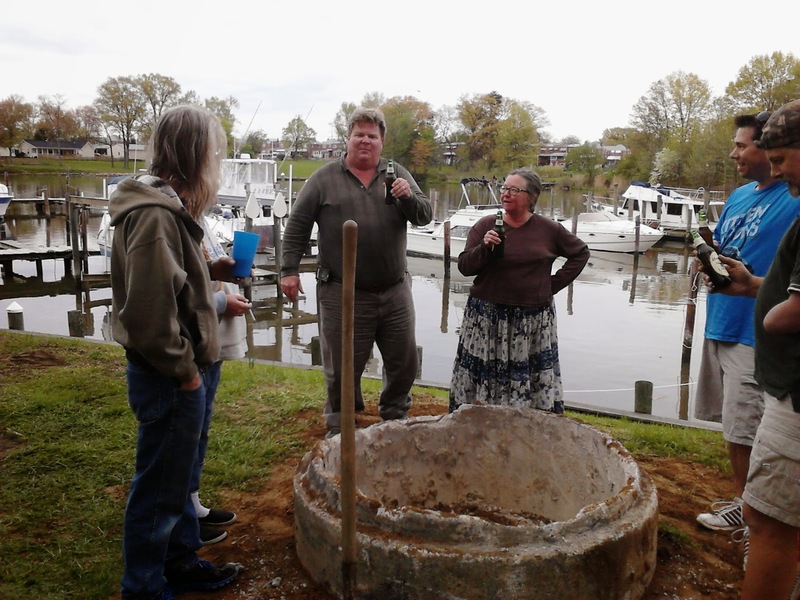 Here's a bit of video of a rather large piece of culvert found on the Marina grounds, repurposed into a fire pit. Once it's evened up and tiled, its going to be a great plus for our little community here. It's amazing what simple things can bring people together, and can create community out of a disparate group of people. Celebrating a potentially horribly dangerous job well done. Okay, so it's not finished. We just HAD to light a fire in it anyway. More later. It's going to be a good summer.